Advances in biology, both pure and related to medicine, require both resources in IT and proximity to clinicians. 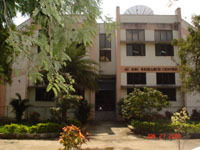 The Centre is well situated to take advantage of its location in a major technology centre. Also Chennai (Madras) is a pivotal medical hub for the S.E. Asian region, apart from being a manufacturing and software development zone. This combination of human and material resources promises a potentially explosive growth in biological research in this region, which the Centre wishes to exploit with its program in life sciences. The primary focus of the biology group in the AU-KBC Centre is on biophysical approaches to membrane and interfacial processes. These experimental studies will be complemented by computational modeling, bio-informatics approaches as well as by collaboration with clinicians for work on diseases amenable to this approach. Interfacial problems are also of interest to other groups as well as researchers in nearby institutions (IMSc, CBT & IITM), which include physicists, chemists and mathematicians. Members of AU-KBC actively collaborates with these groups on theoretical formulations as well as quantitative modeling of the interface. Many of these studies are a continuation of ongoing activities by the researchers in the group, who have expertise on lipases, self assembly and gap junctions as well as single-molecule, near-field, biochemical and electro-physiological techniques. The biology group is also interested in database-centered bioinformatics as well as in computational biology, including quantitative modeling of biochemical networks and interacting biochemical pathways (cell-cell communication). To gain experience with working with clinicians, we are investigating correlations between hereditary breast cancer and gene mutations in the South Indian population.